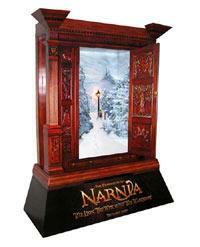 C. S. Lewis's classic, out this winter. If you want to know more about the man, the company, or just the film, check out the interview. I'm excited! This is something that I've been wondering about for a couple of months now, I suppose it has been. The more films I see with these awesome 'man's man' characters, your Aragorns, Han Solos, John McClanes, Maximi, and the like, make me wonder why these characters are so awesome(in a literal sense) to the rest of us every-day guys. 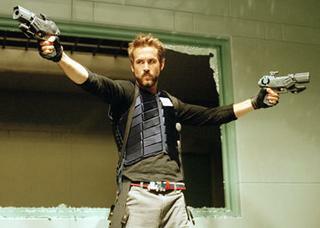 I watched Blade: Trinity last night for the first time, and Hannibal King(Ryan Reynolds) struck me as another of these supermen; he came into the film and a room full of vampires through a one-way window/mirror holding two pistols, wisecracking. So what is it about this sort of macho image that is so attractive to guys? Going down into the lion's den strong and courageous yet light-hearted. The thrill of danger... the same reason I fork out $17 everytime I'm at Six Flags to attach myself to a bungee cord and free fall for a few hundred feet for about 5 seconds. I think men are longing for that thrill(that's why we'll knowingly get ripped off for a poor substitute), and perhaps we hope we can experience it vicariously through these movie-men. We've taken a look at this topic a bit in my British Literature class of late, comparing heroism as it is today, to its ancestor in the time of Beowulf, not to mention that I just recently finished reading Eldredge's Wild at Heart: Discovering the Secret of a Man's Soul, but for all the thinking I've done on it, I can really only come to one conclusion: the 'hero mold' has changed from a chivalrous warrior-knight to a polite, hard-working associate, boardmember, manager, or whatever fills in your blank. And men are still reeling from the change, left with a gut instinct to seek the action and adventure. No wonder the Lord of the Rings Trilogy brought in over a billion dollars at box office. So now maybe all of us guys need to go bear hunting with a Bowie knife, or scuba-diving with a couple of great whites; I don't know. Maybe this change is good, a change in our manner to befit a constantly changing society, and we should go with it. ...I'd prefer to go with the former.